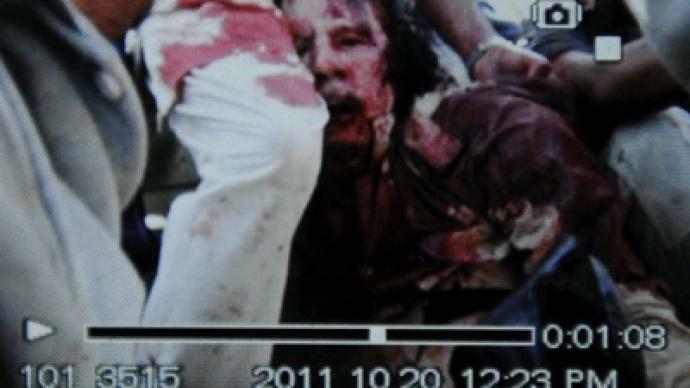 Libyan Prime Minister Mahmoud Jibril has confirmed that Colonel Gaddafi has been killed. The fugitive leader died of wounds sustained in his capture near Sirte. Meanwhile, officials from the National Transitional Council (NTC) have stated that no order was given to kill Gaddafi and that the former Libyan leader was fatally wounded when a gunfight between his supporters and government fighters broke out after his capture. Gaddafi’s corpse has already been taken to Misrata, according to Al Arabiya. According to Al-Arabiya the body was placed in a commercial center in the city's Souq Tawansa neighbourhood. At the same time, Al-Jazeera reported that the body of the deceased Muammar Gaddafi had been placed in a mosque in Misrata. He is to be buried in accordance with all Muslim traditions within 24 hours of his death at an undisclosed place. The place will not be made public to avoid pilgrimages by his supporters. TV footage showing anti-Gaddafi fighters dragging the colonel’s body have been shown on Al Jazeera English and several pictures purportedly showing the slain strongman have appeared on the Internet. An NTC official confirmed the pictures were genuine. The fighters claim they saw Gaddafi getting hit in his lower body by a shot from a rifle. One fighter says he hit Gaddafi with his shoe, which is a grave insult in the Arab world. There have also been reports that the colonel’s son Motassim has been captured in the fallen stronghold of Sirte, while an NTC commander claims he is also dead. There have been reports that Gaddafi’s highest-profile son and one-time heir apparent, Saif al-Islam, has been captured and wounded by anti-Gaddafi forces. But Al Arabiya news channel claims that he was killed and his corpse has already been taken to Misrata airport. NTC leader Mustafa Abdel Jalil will address the Libyan nation shortly and NTC Deputy Chairman Ghoga is expected to announce the liberation of all of Libya within hours. A US official has confirmed that the new Libyan leaders have informed Washington that Gaddafi is dead. According to Reuters, Gaddafi was wounded and captured near Sirte while trying to flee in a convoy which was under attack by NATO. The French defense minister claimed that it was a French jet that fired on the colonel’s convoy. A Libyan government fighter says Gaddafi was hiding in a hole in Sirte, shouting "don't shoot, don't shoot." An NTC official says the head of Gaddafi's armed forces, Abu Bakr Younus Jabr, was also killed during the capture of the Libyan ex-leader. 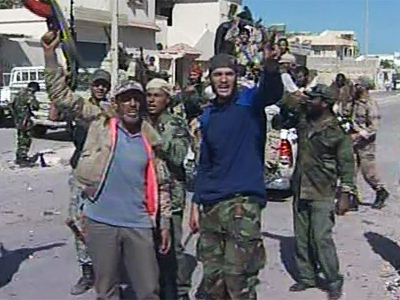 The news comes shortly after NTC forces took control of Gaddafi's home town of Sirte. Earlier, on Tuesday, during her visit to Libya, US Secretary of State Hillary Clinton said she hoped Muammar Gaddafi would be captured or killed. However, pro-Gaddafi media denies reports that the colonel has been killed as “nothing but rumors.” According to Al-Libiya television website, Muammar Gaddafi “is in good health.” The news outlet also warns against fake pictures of a slain Gaddafi that have appeared on the Internet. ­Gaddafi’s death is a logical outcome not only of the civil war in Libya, but also the end of the illegal regime change operation in the country, insists London-based Chris Nineham, an anti-war activist with the Stop the War coalition. “This is basically a colonial operation to remove a government in an African country by European powers and the US,” Chris Nineham says. He says that in any case any celebrations and triumph on the ground is premature because NTC members were picked up and orchestrated from Washington and Paris and they do not represent the Libyan people. ­“It is too early for Libyans to celebrate because NATO is in Libya,” she added, warning that there are a lot of tribes in Libya and if they do not unite, there will be a civil war," believes Beirut-based political scientist Doctor Nada Hashwi. She insists that Gaddafi’s death is a great victory for the NTC and NATO. “Let me remind Libyans: this huge victory, do not let it down like what happened in Iraq, because definitely this dictator has finally fallen down. He is dead right now, and I want them to concentrate on reuniting all the Libyans together to rebuild the country and get NATO out of Libya and out of their heads,” she said.